Figure 1. 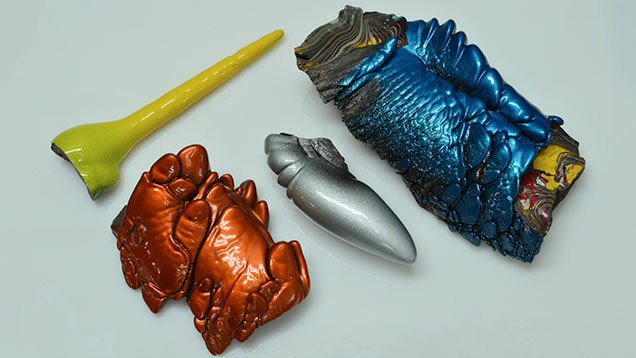 Three fordite slag specimens alongside a partially open piece that shows paint layers with various colors and thicknesses. Photo courtesy of Jay’s Minerals. Gemstone cutter and mineral specimen collector Jason Baskin of Jay’s Minerals (Flemington, New Jersey) presented some spectacular freeform fordite cabochons, a byproduct of an automobile painting process that is long gone. Workers once painted automobile bodies on train cars, which are commonly used on large assembly lines. As the paint was sprayed onto the target, the overspray collected on the train cars, and the accumulated layers of excess paint went together with the painted car body to the oven. The factory removed the accumulation periodically to clean the working platform and possibly recycle the paint. 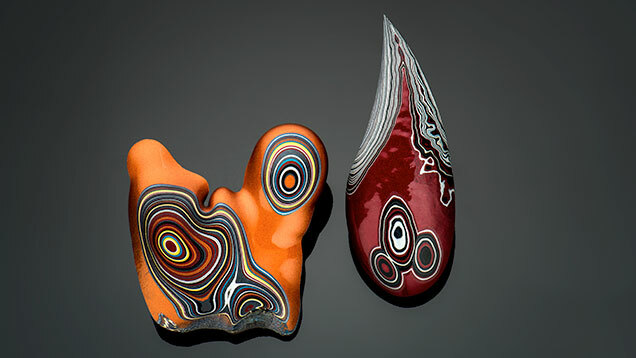 Mr. Baskin was informed by his contact in the factory that it takes about 997 layers of paint to build a one-inch-thick fordite slag specimen (figure 1). Since hand spraying has been replaced by powder painting, fordite is no longer produced, and the material on the market is all that exists. Fordite was first collected at Ford Motor Company in Michigan in the 1940s. The material saved from the 1960s and 1970s has the boldest colors, since cars were painted in very bright colors during that period. Mr. Baskin was introduced to fordite about three years ago by a friend and fellow gem cutter whose uncle worked at the Corvette assembly plant in Bowling Green, Kentucky. Mr. Baskin and his friend now own a substantial collection of the material from that location. Mr. Baskin is also pursuing other sources, including Lincoln-Mercury paint from a Canadian plant and Ford paint from Detroit. He is also looking for fordite from Harley-Davidson motorcycles to fulfill the appetite of Harley lovers. The color layers and patterns of polished fordite are eye-catching, and experienced cutters know how to unveil its most beautiful side (figure 2). Because it is composed of paint, the material is very light. Protection such as a dust mask is necessary during the cutting and polishing processes. Figure 2. Different patterns may be exposed when the fordite material is cut open. The original profile of the paint slag can be kept as well. Strata and concentric color circles are some of the most spectacular patterns. On the left is a 32.36 ct (52 × 64 mm) specimen; the one on the right is 41.86 ct (28 × 73 mm). Both pieces were polished by Jason Baskin. Photo by Robert Weldon/GIA; courtesy of the Clamshell. 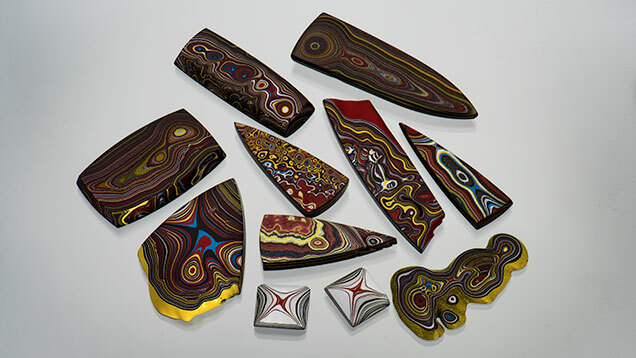 Mr. Baskin noted that jewelry designers and hobbyists purchase most of his fordite, though he also sells the cut material (figure 3) through other gem dealers. Some of the knobs from the heaters and gear shifters in the old Corvettes had a piece of embedded plastic; clients have him cut Corvette fordite to replace that plastic. Pricing ranges from $20 to several hundred dollars apiece. A very rare type of fordite from 1972 with large metal flakes sold for $400 once it was cut into a 40 × 30 mm cabochon. Figure 3. The finished pieces shown here are some of the finest fordites on the market. Photo by Orasa Weldon/GIA; courtesy of Jay’s Minerals. Tao Hsu is technical editor of Gems & Gemology, and Andrew Lucas is manager of field gemology education, at GIA in Carlsbad.